So, if you were in New York City’s Bryant Park this weekend, you probably enjoyed the festivities of the Sonic Colo(u)rs pre-launch party. Despite the rain, Cash Cash played a set, demo units of Colo(u)rs were available for both the Nintendo DS and Wii, and people wore those goofy pre-order Sonic hats–a swell time overall. 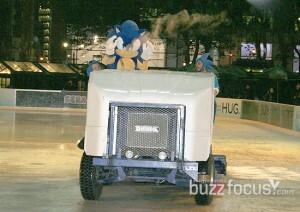 However, clearly the highlight of the action was what seems to have been terribly overlooked: Sonic the Hedgehog riding around on a Zamboni in Bryant Park. This made us realize, in a world of 18-wheeler simulators and theme park management games, among odder genres, there is no Zamboni sim game. Frankly, we need ICE RINK SMOOTHING HIGH SPEED ACTION STAGES, Sega. Where is Sonic Zamboni Riders? Sonic Smoothing Adventure? Tails Rink Patrol? Or perhaps this is a teaser for a game yet to come.